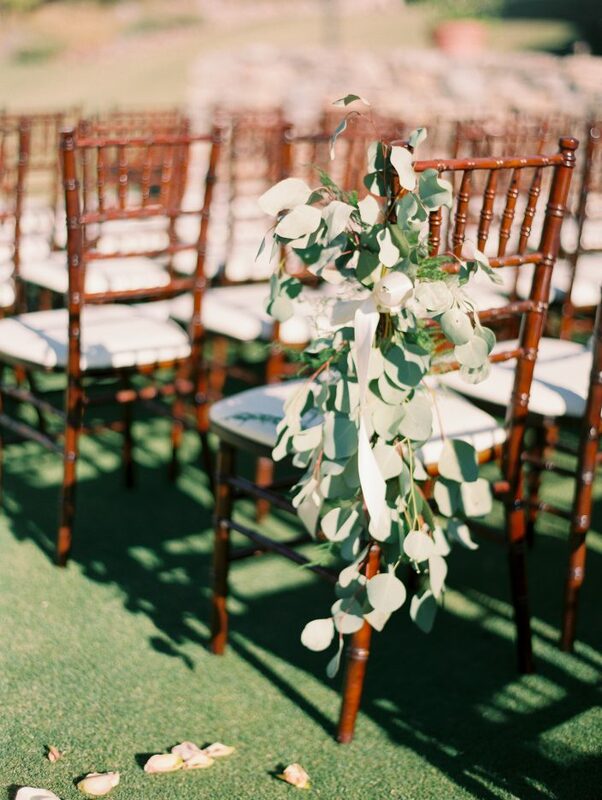 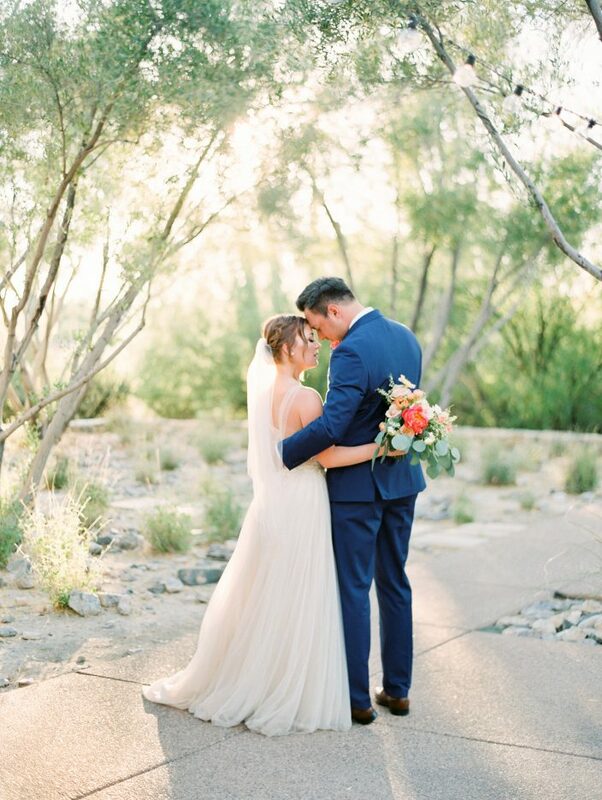 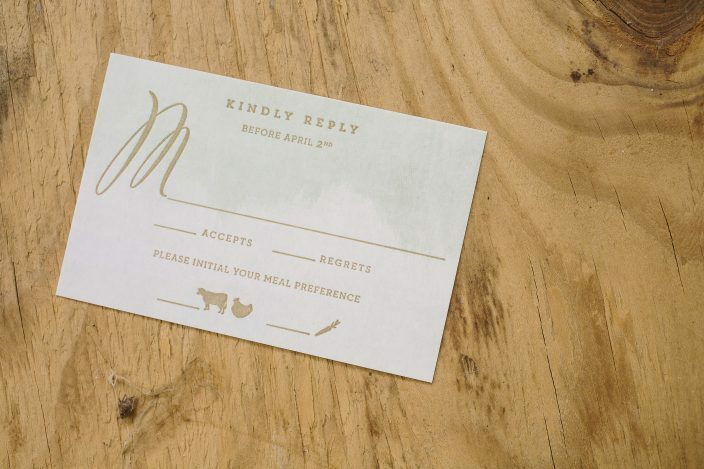 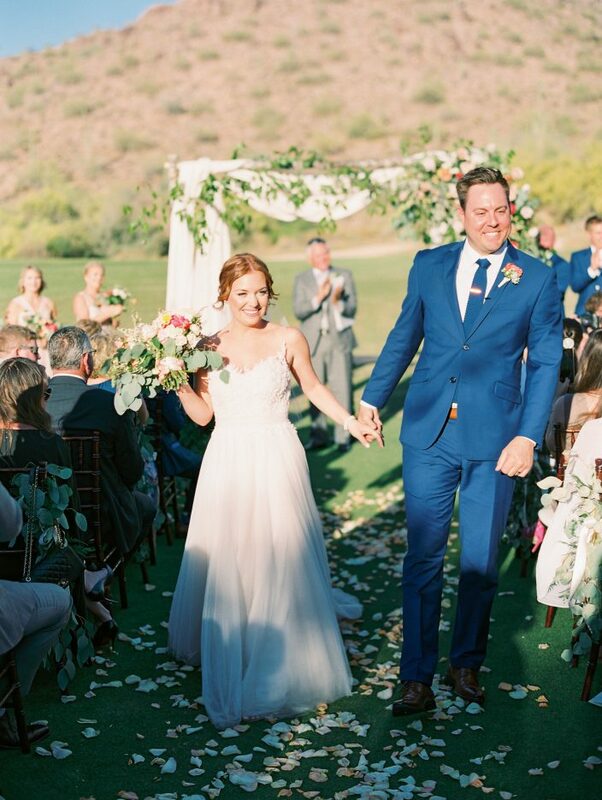 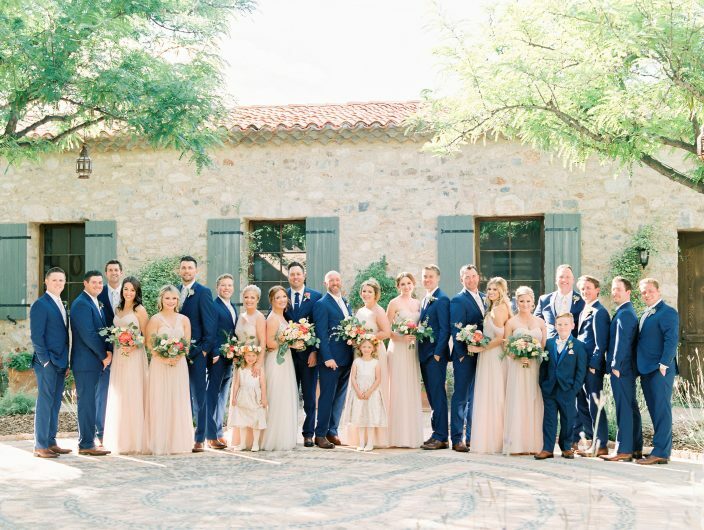 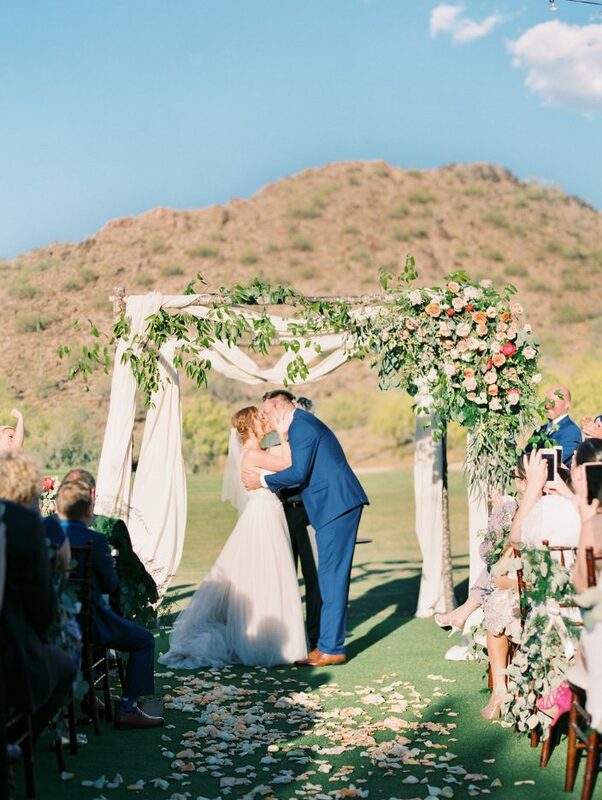 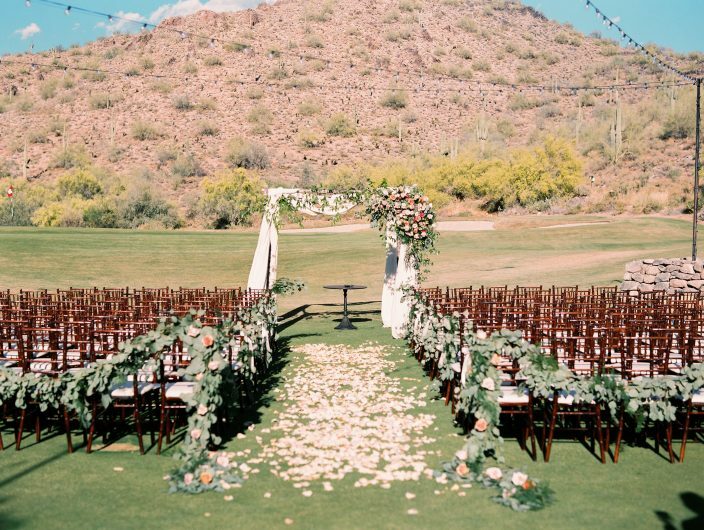 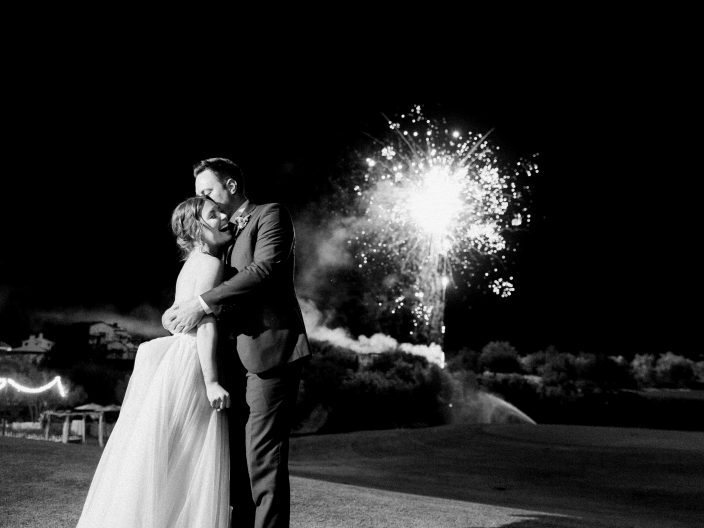 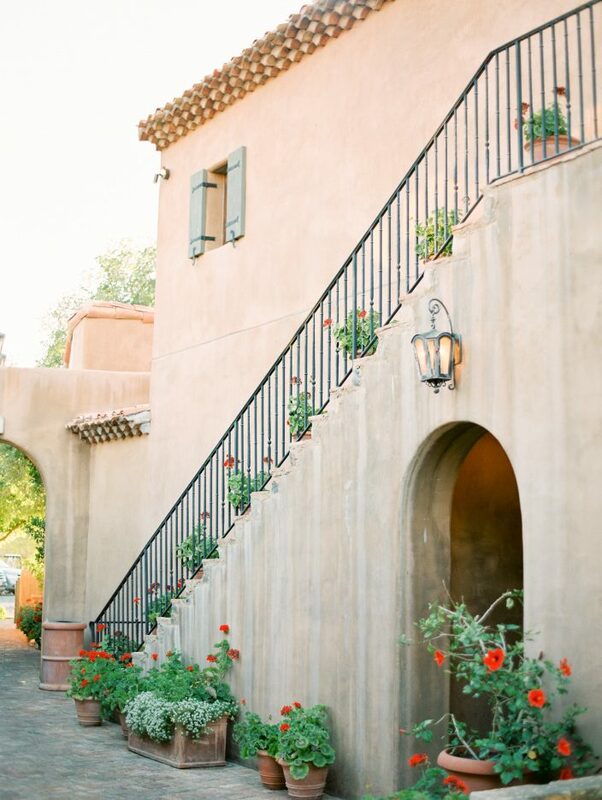 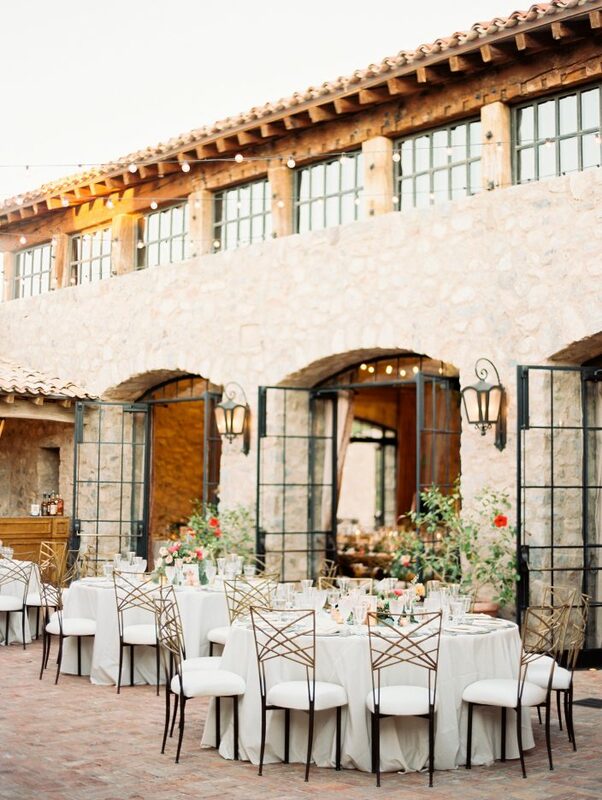 Sarah and Colby customized our Barnesly design for their wedding at the Silverleaf Country Club in Scottsdale, Arizona. 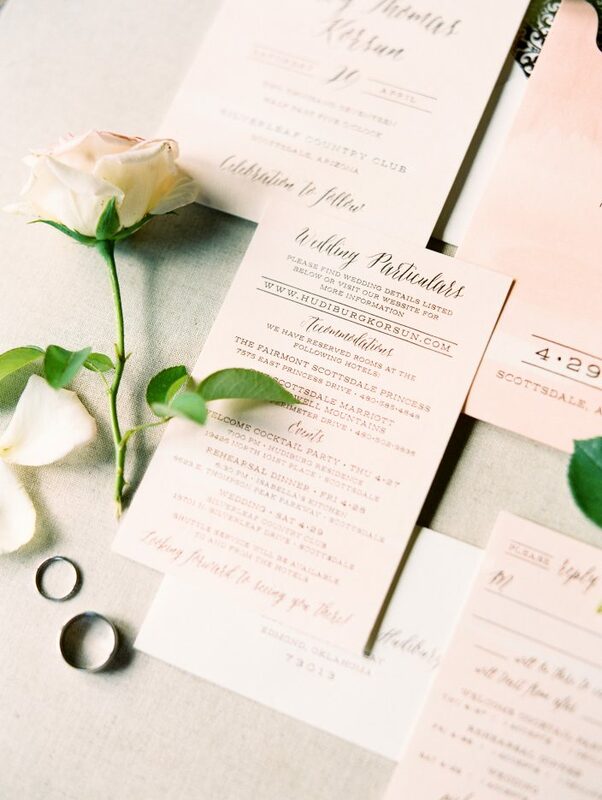 These romantic watercolor wedding invitations showcase our rose gold foil in a charming way against a blush background. 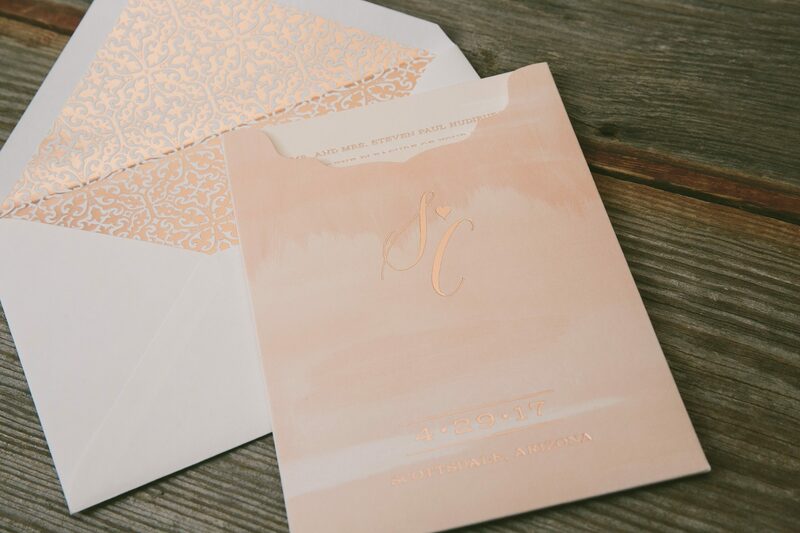 To keep the invitation and various insert cards safe and sound, an eye-catching monogrammed sleeve with foil accents was added to the mix. 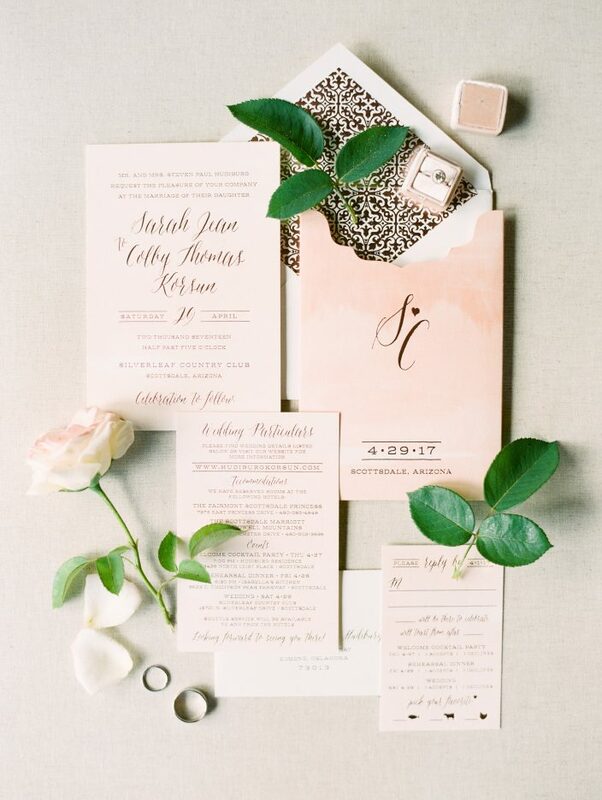 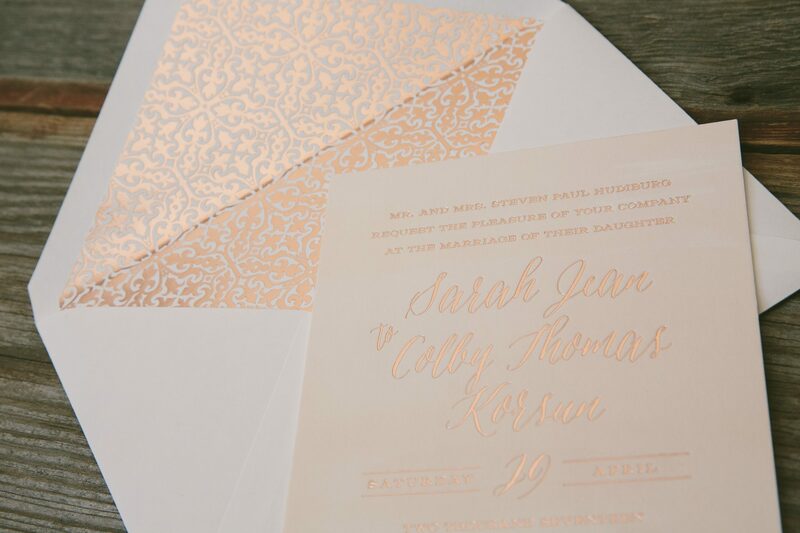 A rose gold envelope liner in our classic amble pattern tied everything together as the finishing touch to this sweet suite. 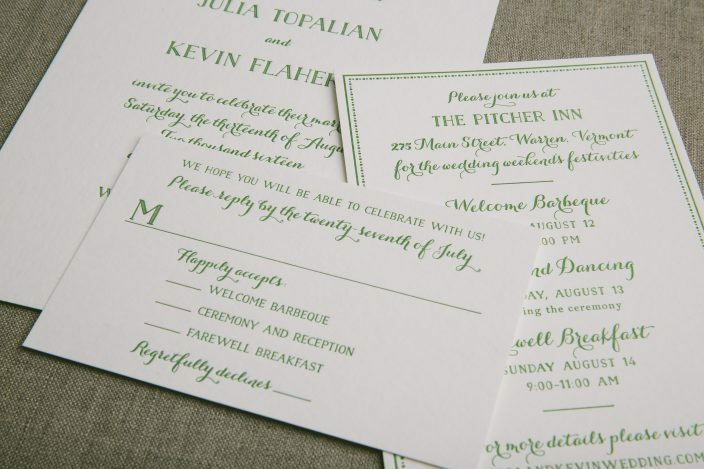 Julia and Kevin customized our Prescott invitation for their summer wedding in Vermont. 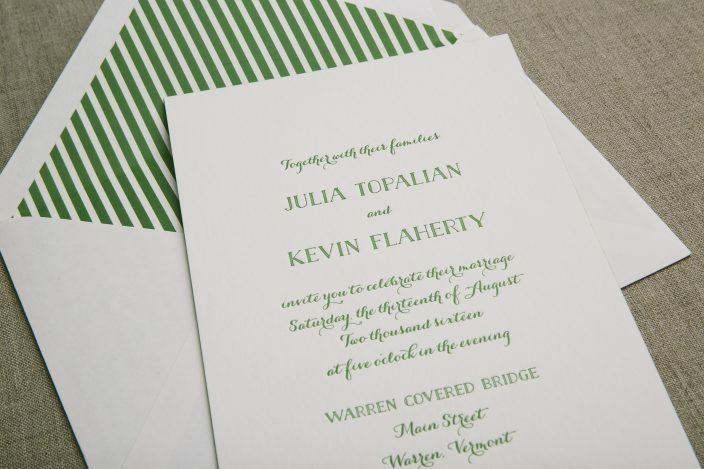 They worked with our friends at Gus & Ruby Letterpress to create a monochromatic look by printing their entire suite in our vibrant grass ink color. 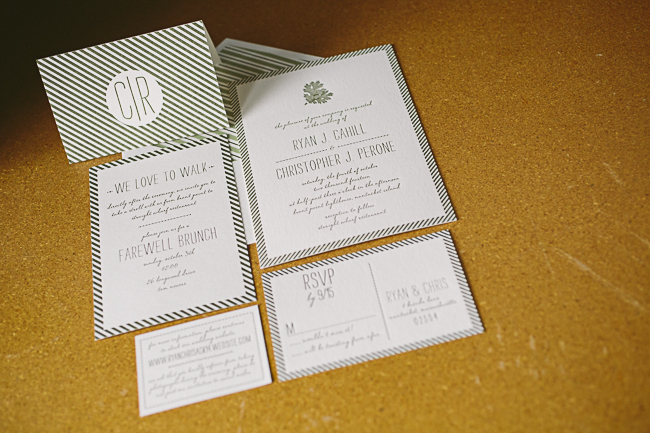 A striped envelope liner added a fun, preppy touch to this sweet but sophisticated set. 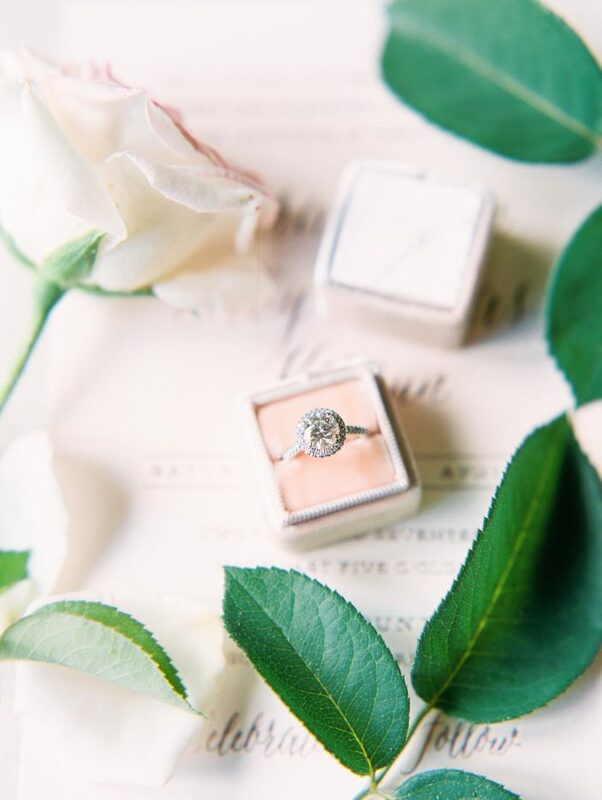 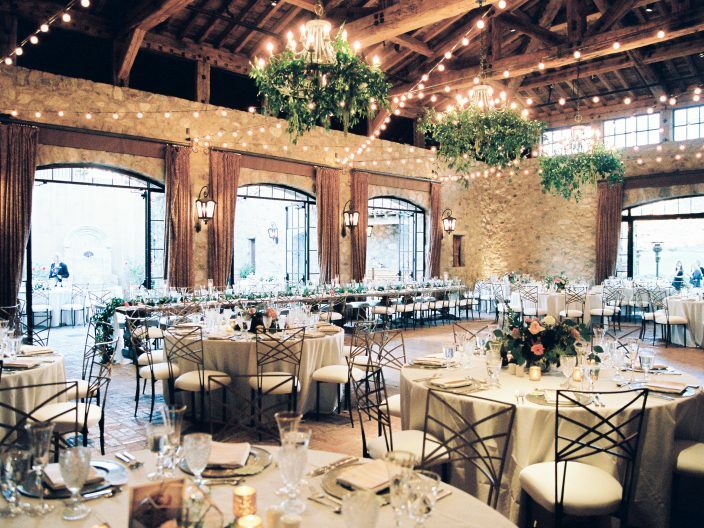 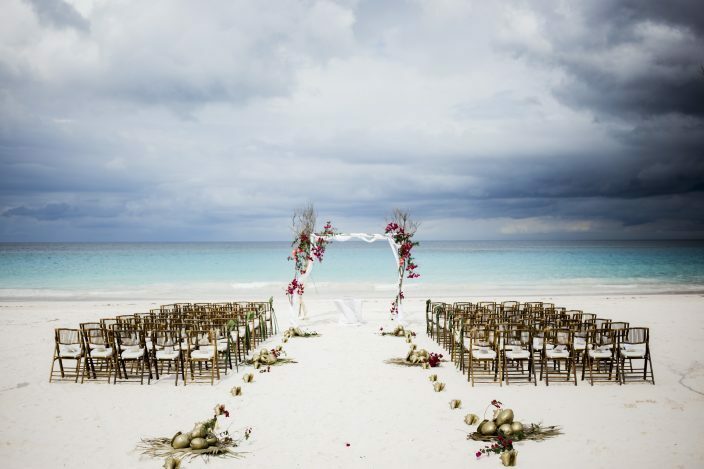 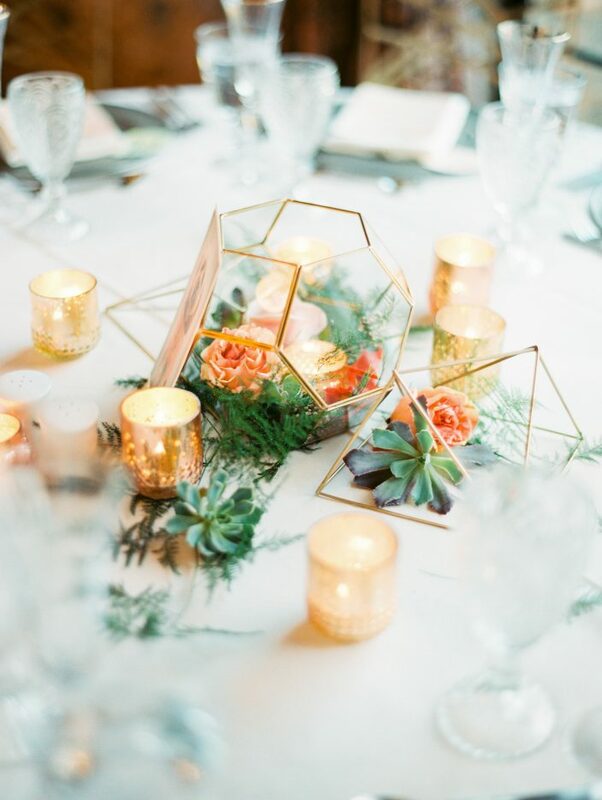 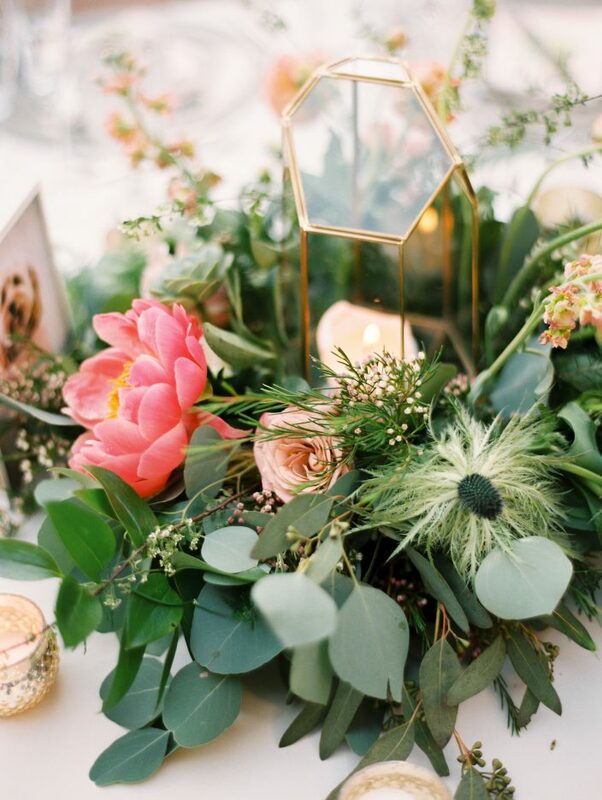 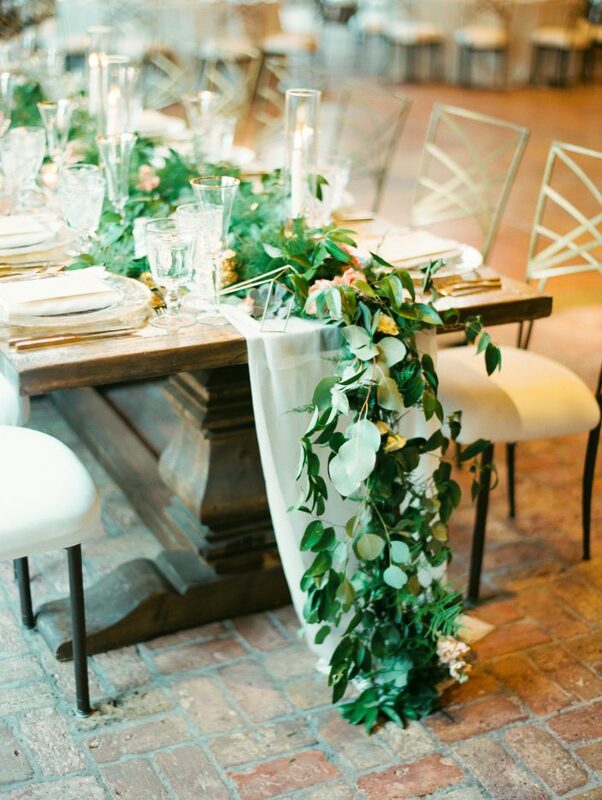 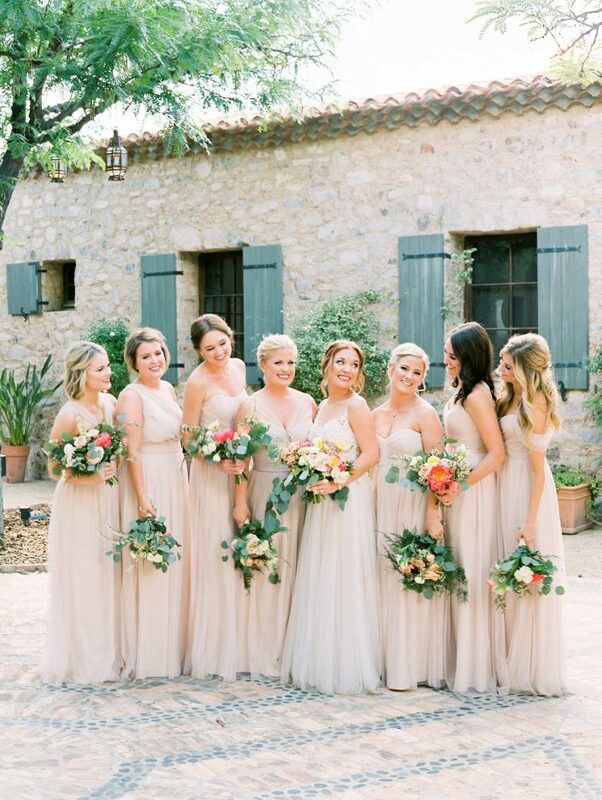 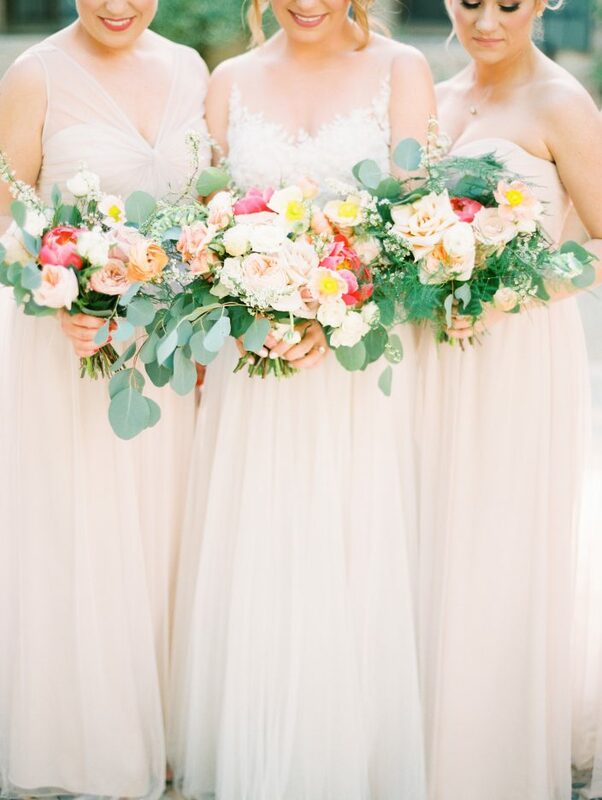 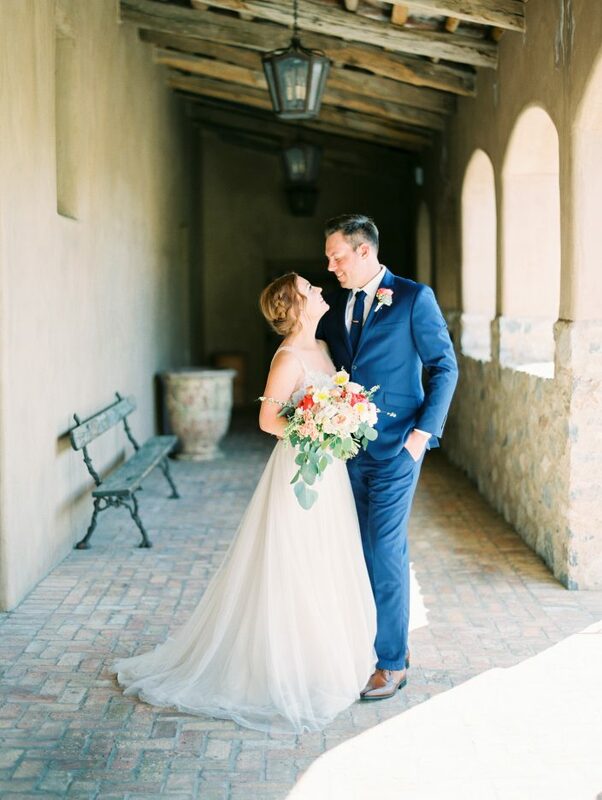 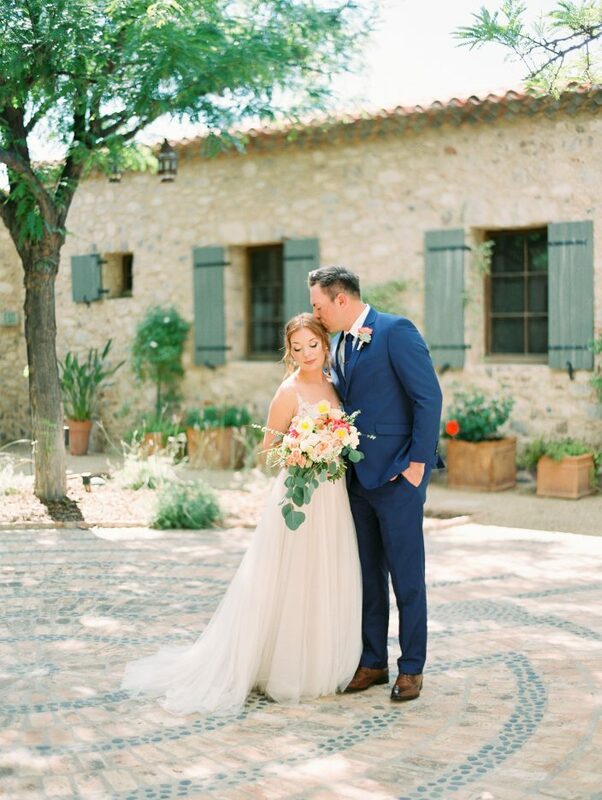 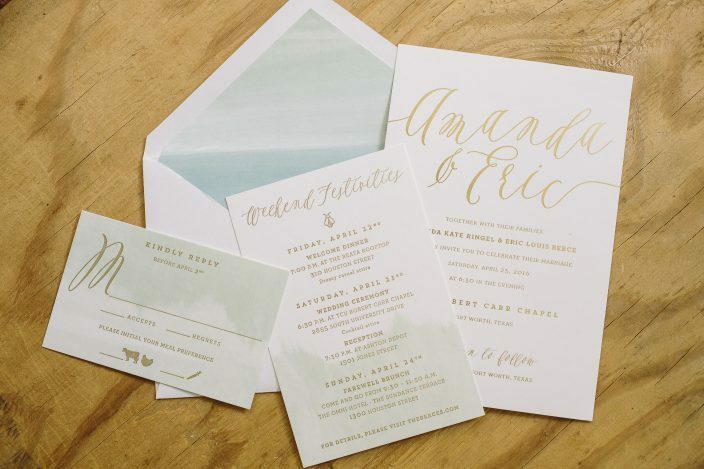 Amanda and Eric chose our Ellory design for their April wedding in Texas, opting for a gold color palette with pastel blue and green watercolor accents. 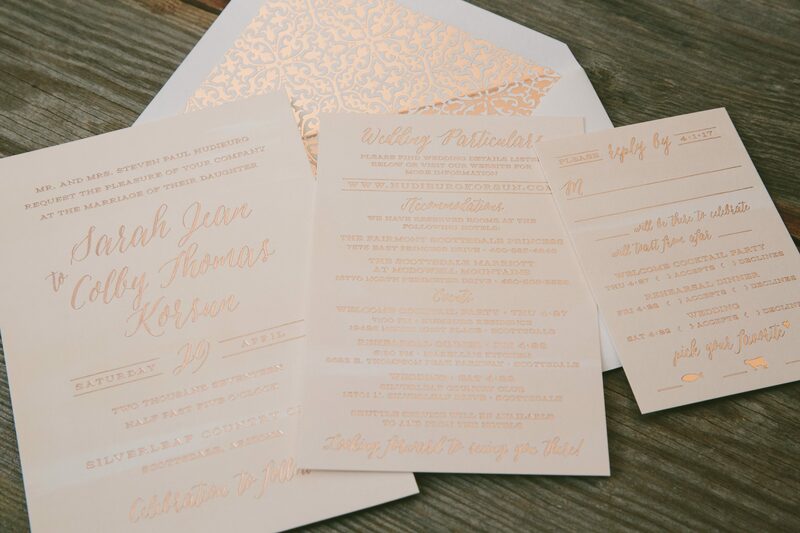 We worked with our friends at Needle in a Haystack to create the set, which included a cute weekend festivities card and a response card in addition to the gold foil stamped invitations. 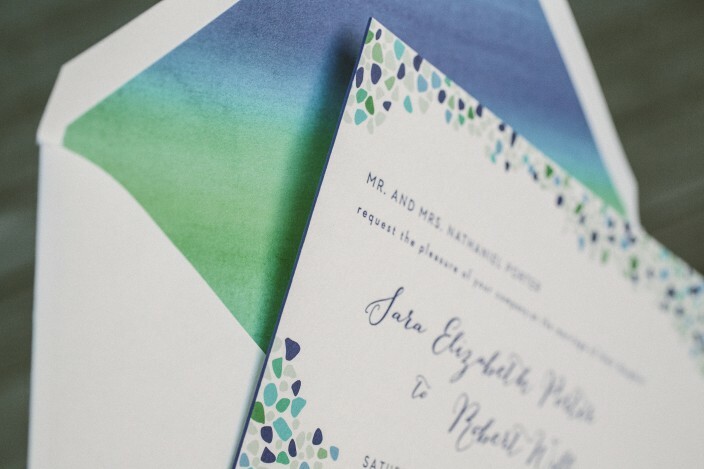 An ocean-inspired watercolor envelope liner introduced a third color and complemented the mint green watercolor accents on each insert card beautifully. 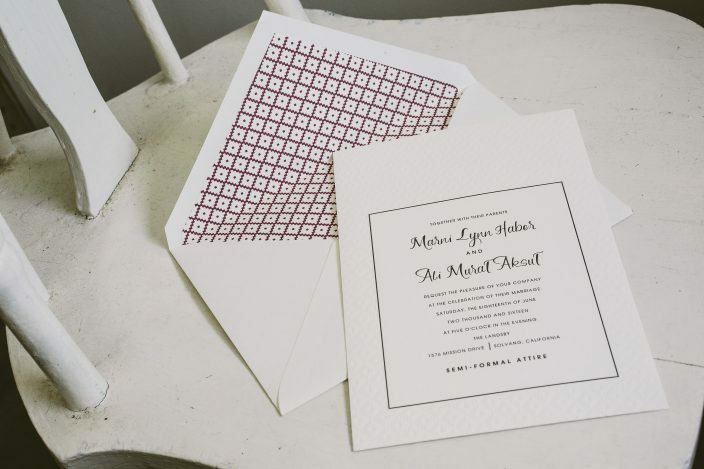 Marni and Ali worked with Desiree at Heirloom Paper to create a cool take on our Flynn design for their letterpress wedding invitations. 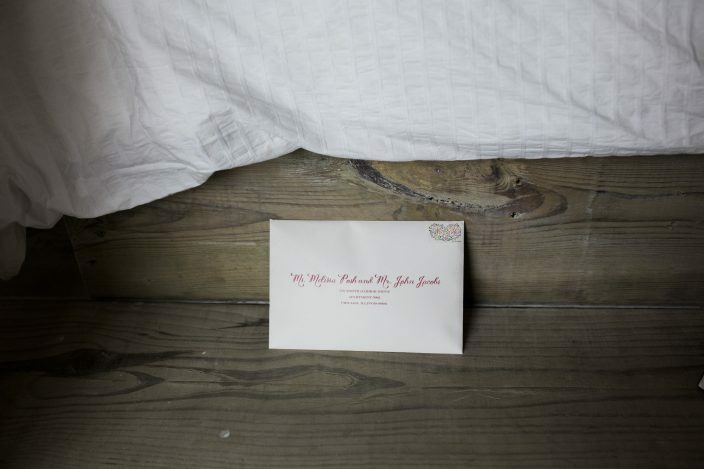 They personalized the design by adding our quilt pattern in blind deboss to the invitations, creating a textural element that was repeated throughout the suite. 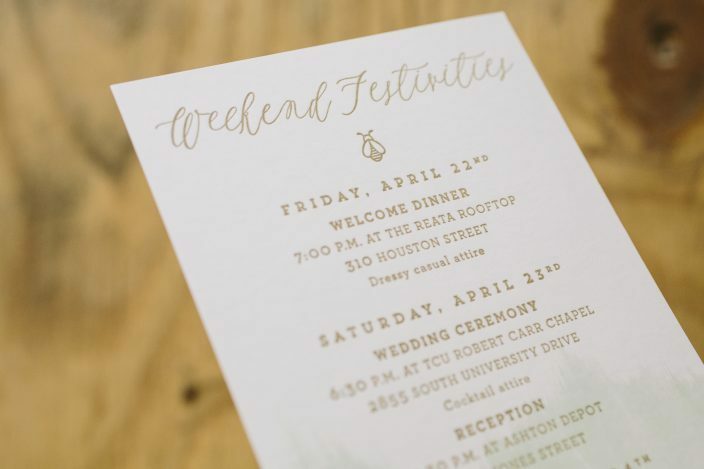 Our Clermont calligraphy font was used to highlight key elements on the invitations and insert cards, like the names of the bride and groom, RSVP card details, and events on their “Friday Festivities” card. 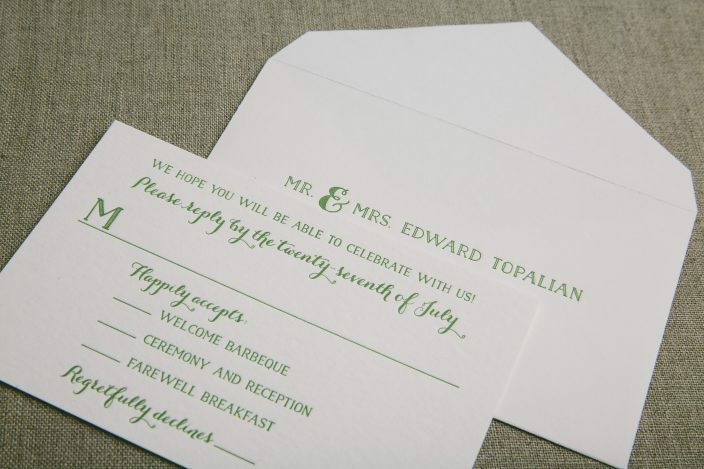 Our quilt pattern was also used on their envelope liners, infusing a small touch of color to this modern set. 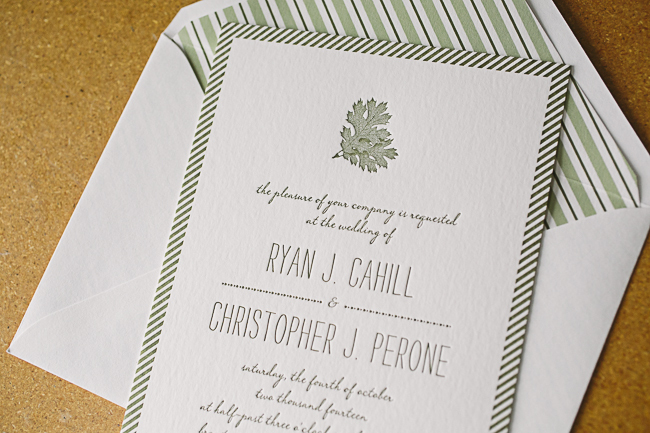 We customized our Fremont design for Ryan and Christopher’s autumn wedding at the Brant Point Lighthouse on Nantucket Island. 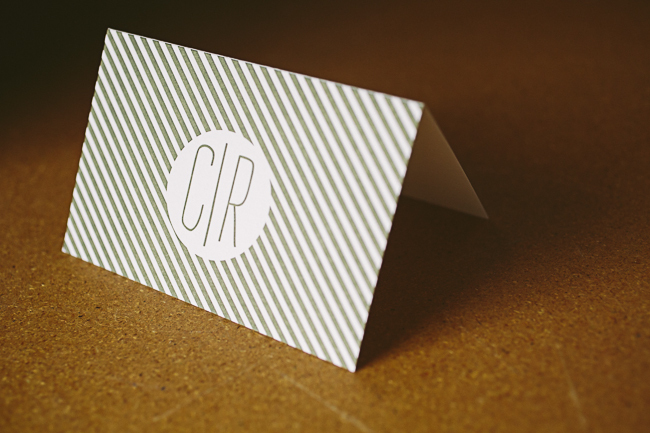 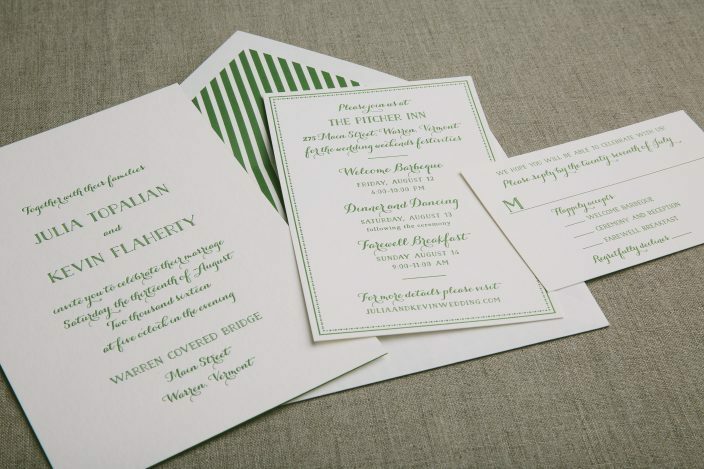 Their letterpress suite was printed in olive ink, and we created striped envelope liners in olive and sage inks to complement the stripes used throughout the set. 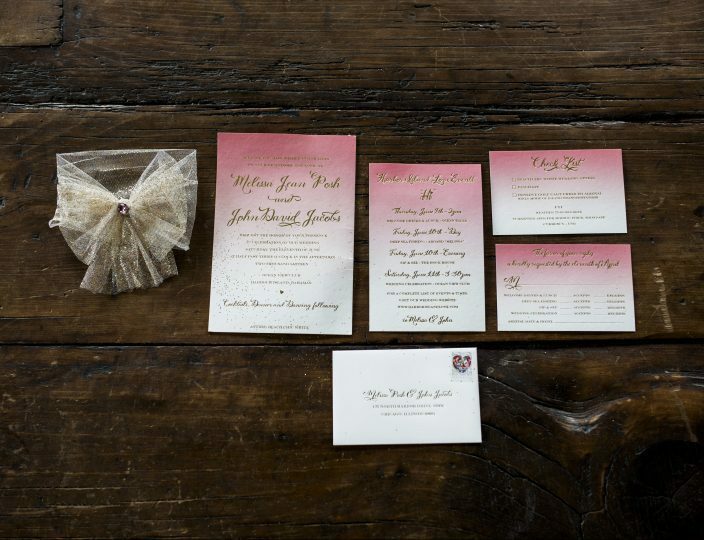 In addition to the invitations, we created folded social notes with a simple monogram, website cards, an events card, and reply postcards. 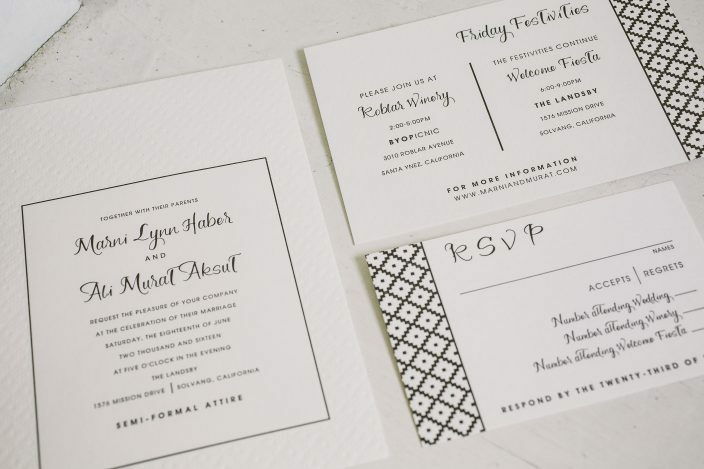 Each piece featured varying stripe designs, and our oak leaf motif added a seasonal touch to these simple yet sophisticated wedding invitations. 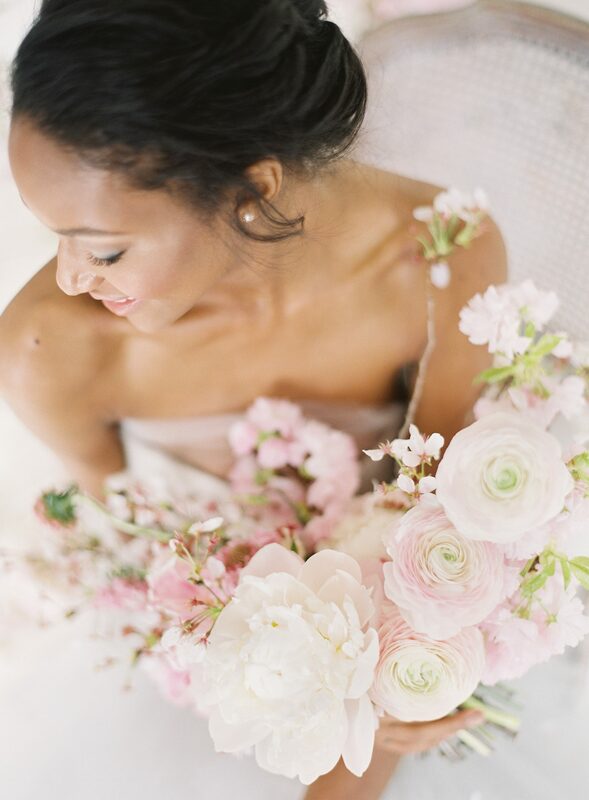 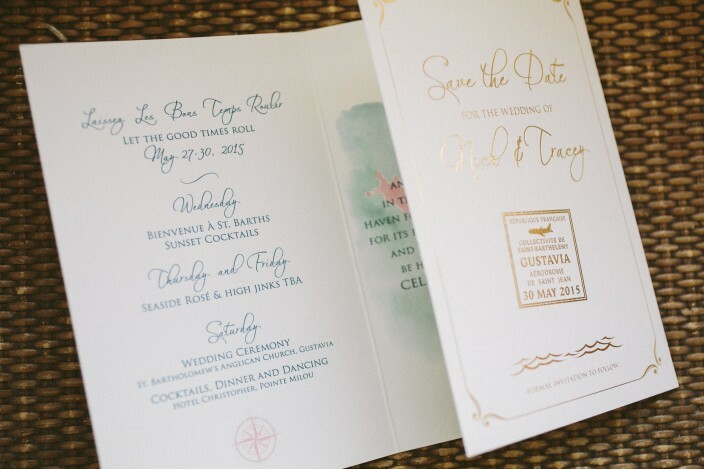 Tracey and Nicholas worked with us to create one of the most beautiful invitation suites we’ve ever printed! 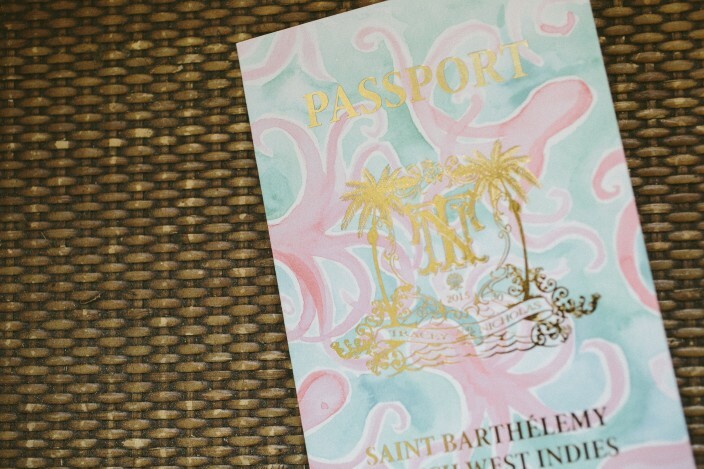 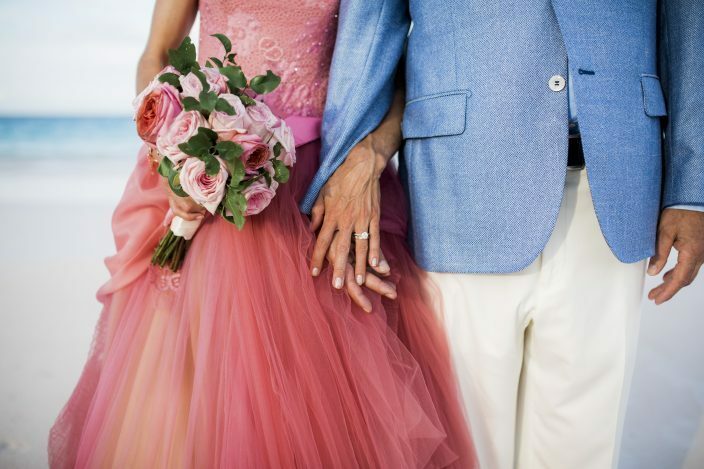 For their May wedding in St. Barths, we digitally printed their tri-fold, passport style save the dates in pretty blues and pinks, then added gold shine foil stamping. 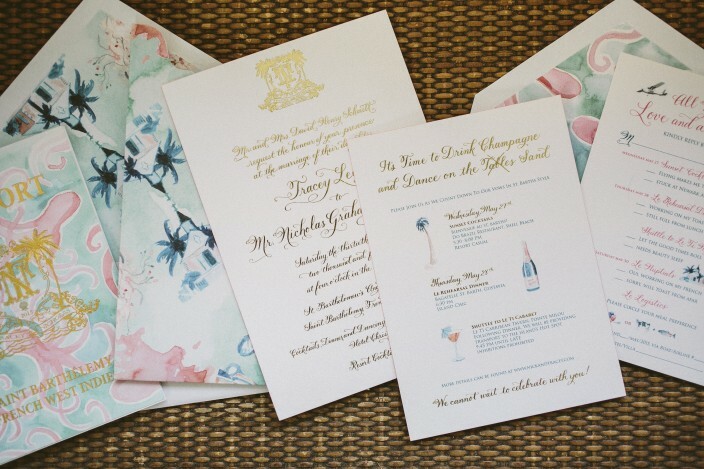 An intricate custom crest complete with palm trees and their monogram was printed on both their save the dates and their gold wedding invitations, which also featured hand calligraphy. 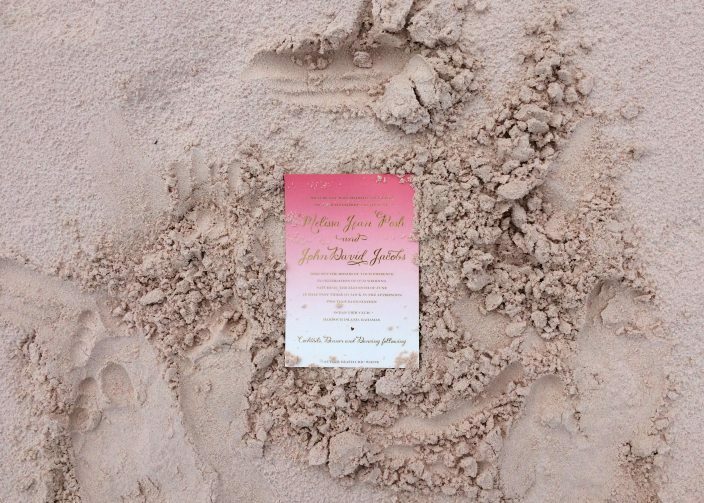 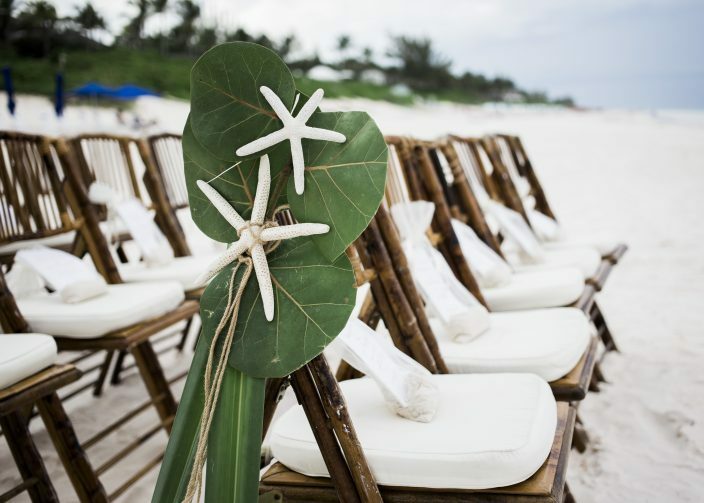 Their tropical invitation set included an events card and a reply card, which fit inside of a vibrant invitation sleeve complete with personal motifs – like the wedding chapel, a bottle of champagne, palm trees, and even the couple’s pup! 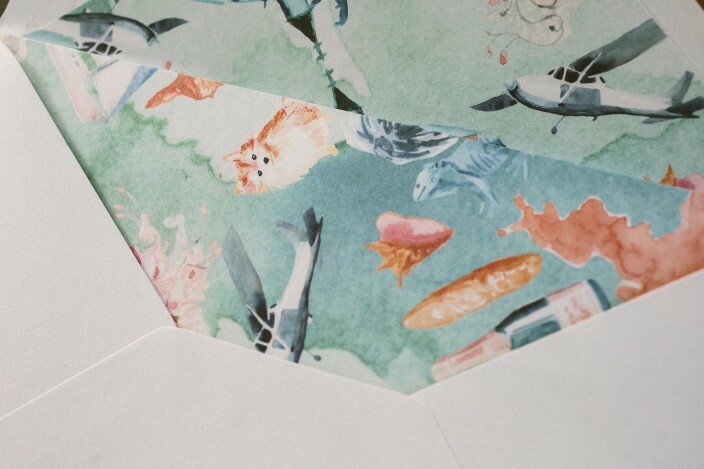 Custom envelope liners for both the save the dates and the invitations were created to match each piece accordingly. 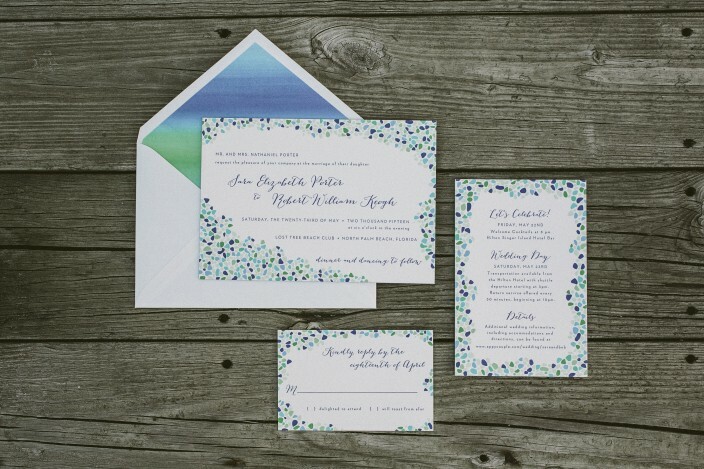 A beautiful array of soft blues and greens were featured together on this sea glass inspired version of our Keira invitation. 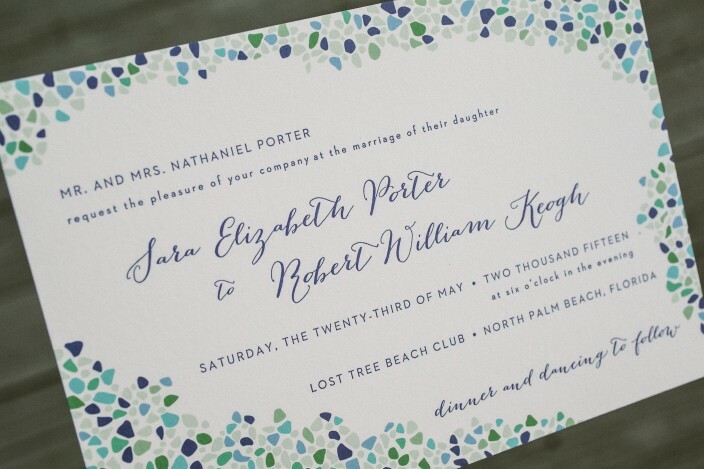 Sarah and Robert chose letterpress printing in azure ink for the main text on their invitations, which added texture to the colorful, digitally printed piece. 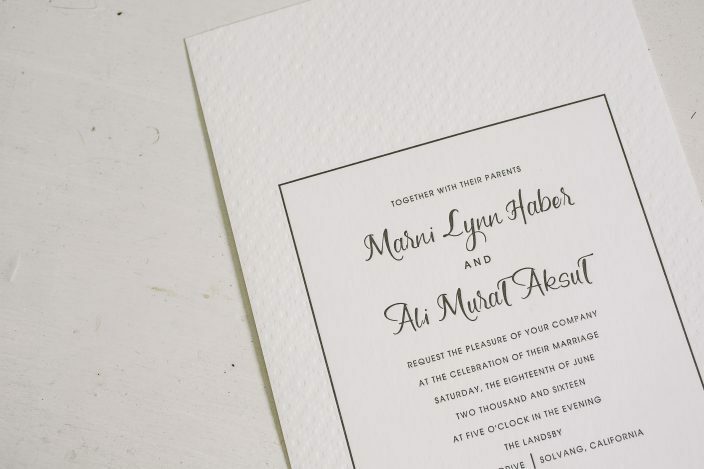 We duplexed the invitation and added azure edge paint to make the piece more substantial. 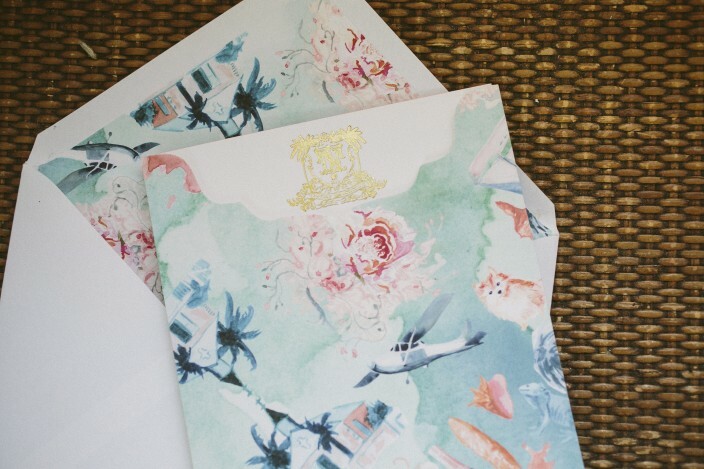 Reply cards and event cards were printed to match, and a custom watercolor envelope liner added an extra layer of color to this unique invitation set.